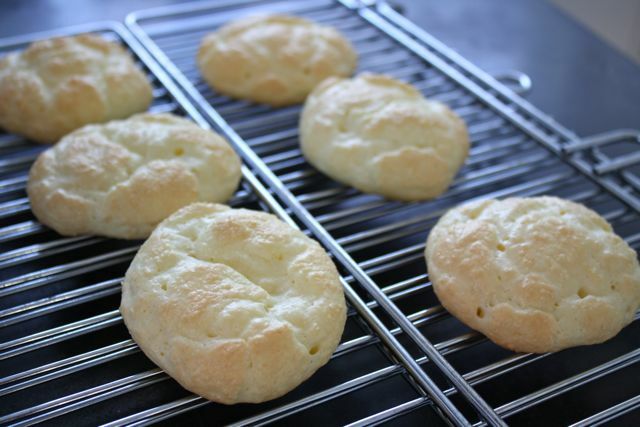 Pan de yuca – warm, salty and a little bit chewy. What more could you ask for in a quick little bun? Not much, I'd say. Which is why these are quickly becoming a new standard at my house. 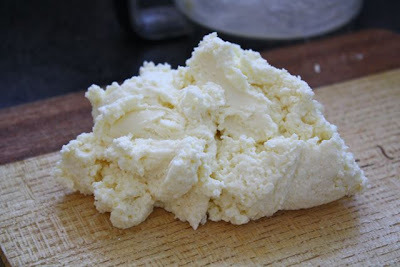 The original recipe calls for queso fresco, but here on the Prairies, queso fresco is not stocked in my grocery store. I used feta instead and it gives them a good, salty heft. Now, my Colombian friend tells me that I can make queso fresco and that it's much like ricottta, so I'll have to try that next time. But, honestly, I'm pretty happy with these feta darlings -- although I do see they get more rise in the original queso fresco version. They are truly simple – faster than whipping up a batch of biscuits, I'd hazard. 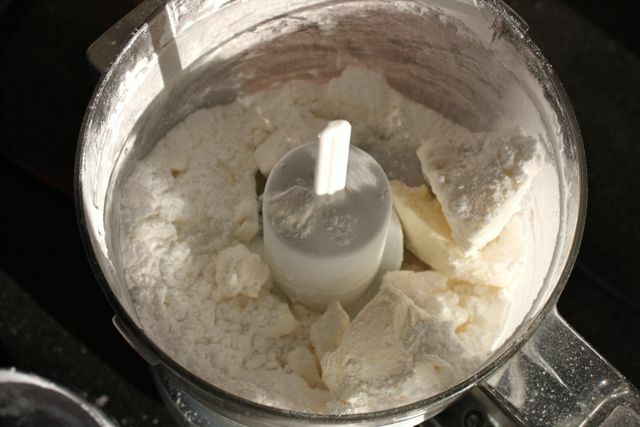 Just whiz the feta, tapioca starch*, baking powder and a teeny bit of sugar in a little food processor (mine is called the mini-hachoir!). Blend in an egg, pull it out . . . The dough is wet and craggy, but easy enough to roll into little balls. The buns only take 15 minutes to bake (while you're putting the finishing touches on your soup, say) and they're perfect warm out of the oven. And – bonus! – they're also good cold with your lunch the next day. *You should be able to find tapioca starch at most grocery stores. Look in the gluten-free section. Preheat the oven to 450 degrees Fahrenheit. Line a cookie sheet with parchment paper. Stir the tapioca starch, baking powder and sugar together. Pour into the food processor. Add the feta and pulse until mixed well. Add the egg slowly and pulse until just mixed. 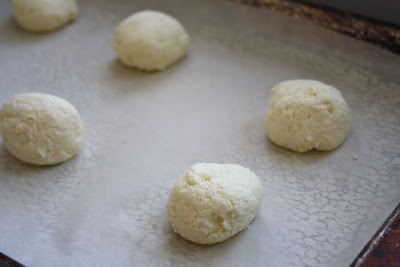 Pull the dough out and shape 12 balls. Place them on the prepared pan. Bake for 14 – 15 minutes, or until golden brown on top. Serve warm. These look really good Stephanie! Do you know if they are anything like the tapioca starch buns that Transcend serves? They are similar, but different . . . The ones at Transcend are pao de queijo and they're Brazilian. I have a great recipe for pao de queijo, also with tapioca starch and the cheese is parmesan. I LOVE them, but they're a lot more work than pan de yuca. Let me know if you'd like me to send you my pao de queijo recipe . . . Interesting! Thanks. I will stick with these for now - easy is good. I have to stock up on my tapioca starch and then I will definitely try them! ... they look awesome! ... 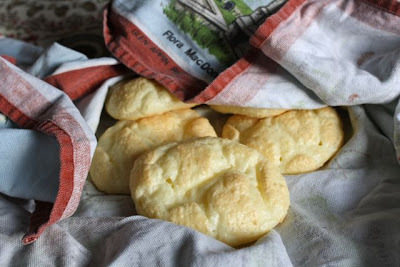 I just love the pandeyucas... and I have to tell you that in Paraguay they also made their own version, pretty similar to the Colombian one, they are called Chipas and they use "queso duro", I guess it should be a kind of feta cheese... I love the globalization in the kitchen! Chao!